Did Humans Exist With God Before They Were Born On Earth? If you examine different religions, it is not uncommon to find that many people believe that humans have an existence outside of their present bodies. Some say that we are spirit life forces that existed before we were born and will continue to exist after we die. Others believe that our soul had a point of origin and it goes through cycles of birth and rebirth as part of a reincarnation process. However, when it comes to the Bible, many people are not sure what the Bible teaches on the topic. 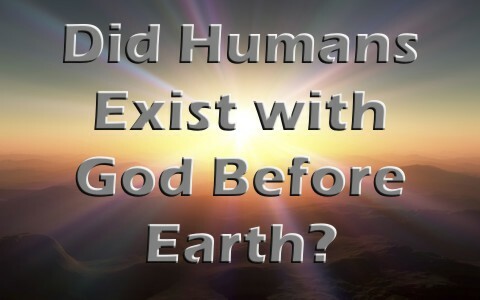 Biblically speaking, did humans exist with God before they were born on earth? The Bible teaches us that humans have three parts, a body, soul, and spirit as follows: “And the very God of peace sanctify you wholly; and I pray God your whole spirit and soul and body be preserved blameless unto the coming of our Lord Jesus Christ” (1 Thessalonians 5:23). It also teaches us that God demonstrated His power to create the body, spirit, and soul when He made Adam: “And the LORD God formed man of the dust of the ground, and breathed into his nostrils the breath of life; and man became a living soul” (Genesis 2:7). Likewise, the Bible teaches us that God has the power to separate the spirit and soul from the body: “For the word of God is quick, and powerful, and sharper than any twoedged sword, piercing even to the dividing asunder of soul and spirit, and of the joints and marrow, and is a discerner of the thoughts and intents of the heart” (Hebrews 4:12). With this power, it is clear that these three parts combined make us a human being. What is the difference between the body, spirit, and soul? It is pretty obvious what a body is to most people. However, there are two types of bodies, terrestrial (earthly) and celestial (heavenly). 1 Corinthians 15:35-50 gives a good explanation of these two types of bodies as follows. The terrestrial body is the body that we have on earth and it differs from the bodies of animals. It is corrupt, or imperfect. It does not naturally honor God. It is weak, natural, and made up of elements found in the earth. On the other hand, the celestial body is not of this earth. It is incorruptible, glorious, powerful, spiritual, and heavenly. The earthly body is a descendant of Adam and the heavenly body is a descendant of God. Therefore the earthly body made of flesh and blood cannot inherit the kingdom of God. However, the heavenly body can inherit the kingdom of God. As humans, we first exist with an earthly body, not a spiritual one. However, we are born again into God’s family when we trust Christ as our Savior (Galatians 6:23). At the moment we are born again, we receive the Holy Spirit, who gives us eternal life. However, this eternal life does not rely upon an earthly body to survive. It is eternal, because our soul becomes one with God’s Spirit and at the moment that our earthly body dies, God separates our soul and spirit from our bodies and we find ourselves in the presence of the Lord (2 Corinthians 5:1-8). Man also has a spirit, which gives him the power to live in his body. As we just read in Genesis 2:7, when God breathed into the man He had just created, Adam became a living soul. It was the breath of God that was the Spirit that gave Adam’s body the power to live and it also created his soul. For humans this spirit comes from God and returns to God upon death of the body (Ecclesiastes 12:7; James 2:26). Man also has a soul, which gives him his conscious existence. The soul is what makes up man’s being as a person and gives him emotions and appetites. When the body of a man is energized by the spirit of life given by God, man becomes a living soul (Job 32:8). As we saw in Genesis 2:7, Adam’s soul was created when God created him and gave him the spirit of life. Without this spirit, a body cannot live (Ecclesiastes 8:8; Matthew 10:28; James 2:26). A practical example of this is seen in a television. A television has a screen, internal electronics, and an electrical cord. When you plug the cord into an electrical outlet, the television becomes energized with power. When the television is turned on, sounds and images are created. Symbolically speaking, the sounds and images created would be the soul of the television. What does the Bible say about the existence of our soul in the context of time? Some people think that Jeremiah 1:4-5 proves that we existed before we were conceived: “Then the word of the LORD came unto me, saying, Before I formed thee in the belly I knew thee; and before thou camest forth out of the womb I sanctified thee, and I ordained thee a prophet unto the nations.” However, the word “formed” is the exact same Hebrew word that is used in Genesis 2:7. This shows us that just as Adam was conceived the moment God breathed the spirit of life into him and he became a living soul, our souls were conceived the moment God gave our bodies the spirit of life inside our mothers (Job 31:15; Zechariah 12:1; Isaiah 44:2; Isaiah 44:24; 1 Corinthians 2:11; 1 Corinthians 15:45). Some teach that we existed in heaven before we were conceived. The Bible says only Jesus came from heaven, and that no one but Him has ever seen God. This is because we come into being on earth (John 1:1; John 17:5; 1 Corinthians 15:46-49; Colossians 1:17; 1 John 4:12). If we all existed in heaven before conception, then how could Jesus say to an unbeliever, “I never knew you” (Matthew 7:21-23)? Likewise, we do not experience multiple lives with the same soul as we see in Hebrews 9:27 “And as it is appointed unto men once to die”. Finally, some will say that we did exist before conception based on verses about God’s foreknowledge (Jeremiah 1:4; Romans 8:26-30; Ephesians 1:4). However, the key word is “foreknowledge”, which indicates a knowledge about us before we existed. We have to understand that God has no beginning and no end (John 1:1; Hebrews 1:10-11; Revelation 1:8-11; Revelation 21:6; Revelation 22:13). Therefore, He can know us before we were ever created. In a small way, this is much like how an engineer can know everything about a bridge before it is even built because he designed it. With God’s foreknowledge, He knew in eternity past who would love Him and who would reject Him. Because He foreknew who would love Him, He predestined those whom He foreknew (believers) to be conformed to the image of His Son, Jesus (Romans 8:28-30; 1 John 5:1-5). This means that one day, when we stand face to face with the Lord, we will fully know Him as He knows us (1 Corinthians 13:12). The Bible teaches us that humans have three parts, a body, soul, and spirit. There are two types of bodies, terrestrial and celestial. Man also has a spirit, which gives him the power to live in his body. When the body of man is energized by the spirit of life given by God, man becomes a living soul. The soul is what makes up man’s being as a person and gives him emotions and appetites. The Bible teaches that just as Adam became a living soul at the moment God breathed the spirit of life into his body, humans become a living soul at the moment of conception. Resources – Scripture quotations are from The Holy Bible, King James Version. Williams, Michael L., (2013). Bible Doctrines. Albuquerque, NM: Selah Mountain Bible Institute. This article did not answer my question, which wasn’t really if humans exist before conception. It does adequately answer what it set out to answer… but, it touched on my question in the Ecc. 12:7 quote about the spirit. Going back to the bridge analogy, there was iron in the forge before it was cast, and there was ore in the ground before it was mined. We would not call it a bridge at that point, however, if that iron was spirit that came from God instead of a ferrous ore that came from the earth, would “spirit” have awareness? Would the raw materials that form a human preexist and convey any of those properties into the newly formed human? Can deep call to deep (Ps 42:7) in the waters of the womb in this context? Hello Laurel. Nothing existed before God and there was no matter before the creation, of course, The spirit is our human spirit but Solomon’s context, which is found in the entire chapter, is about living this life and getting older (Ecl 12:1-7) and not about the eternal state of man after judgment. Context means everything in this verse. Thank you for your question. Christ tells us we must be “born again” (born from above) born of woman…the fallen angels refused to be born of woman and came to Earth contrary to God’s will.. (Jude) God hated Esau before he became flesh…this flesh is a platform for us to choose whom we will serve…. Hello Mr. Bouldin. I believe angels can never be born again. They are spirit and spirit cannot be born again. I see no examples in the Bible and angels were not able to be born of a woman because they existed long before humans did. If as you stated above, God for knew all who would follow Him and who would not, how is there a choice to chose God or reject Him? I thought we had choice and that and after the fall of Satan in Genesis 1:1, is when God gave us that choice. Jesus said whomever will come to Me may have eternal life, so all those who choose God do so if they come. Jesus will not come to you. We do have choice and are responsible for our choices, but read Romans 1 and 2 to see that humans in general, still reject God and His existence because of their immoral lifestyle. God cannot be completely understood, nor His ways made known fully. We trust Him anyway.